When you need a professional flashlight wondering how much can weigh the torch? It is to shine efficiently, so it must be hard. What size must be hardware? To efficiently illuminate the torch must have large dimensions. Is that really have to be? No. 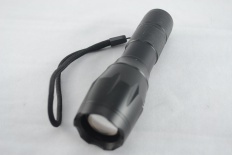 We present to you a professional flashlight 3800 lm. It is surprisingly small, is surprisingly lightweight aluminum. It appreciated her many mechanics and many aircraft mechanics. Flashlight can also be used as a light bike. You can choose what you want to power the flashlight. Remove the rear part of the torch. In the middle is a module that allows to install three AAA batteries. After installing the battery, make a flashlight that is ready to work. If you use the battery, pull the battery module in its place, insert the plastic sleeve and the charged battery 18650 After the spin the rear of the flashlight is suitable for use. In the back of the flashlight is a button that allows the inclusion of a flashlight. When the button is pressed twice flashlight torch will also begin to flash (SOS). Illumination range. Flashlight allows you to change the account of lighting and wide lighting. The front of the flashlight can be of different lengths. Sam regulate its length. Adjust the torch to your needs. The lamp can be used at home and at work. It has countless applications. The lamp can be used in mechanical workshops. The device can be used to illuminate the bicycle (for this purpose should have a special handle). What is a lumen? It is a unit of luminous flux sent into the unit solid angle. This product was added to our catalog on Sunday 11 December, 2016.